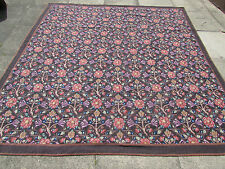 Very Rare carpets this size and beauty almost never come up for sale. Probably 18th Century. 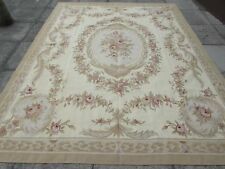 Huge Spectacular beautiful floral grand Wool Rug Carpet Antique approx 30ft long X17ft wide or 9 meters X5.2 meters Savonnerie Aubusson style carpet. From Faringdon House sitting room Lord Berners Zinovieff Heber Percy. There has been various repairs and patches on the massive carpet see photos for details. This is a huge rug with underlay it weights approx 200 or 300 kg so will need freight carrier. Can arrange for a delivery Please email for quotes. Collection preferred from Brighton. 182X124cm 6'x4'2". An Old Hand Made French Design Wool Original Aubusson. The Aubusson is not perfectly rectangular or evenly straight due to being handmade. The Aubusson may not be perfectly rectangular or evenly straight due to being handmade. 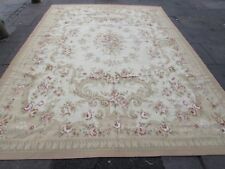 Exceptionally fine Aubusson design Chinese petit point carpet in beautiful colours. TYPE: embroidered by hand. AGE: modern. SIZE: 3.05m x 2.44m - 10ft. THE RUG ATTIC. YOU CAN ALWAYS FIND HIDDEN TREASURE IN THE ATTIC! 263X175cm 8'9"x5'10". An Old Hand Made French Design Wool Original Aubusson. The Aubusson is not perfectly rectangular or evenly straight due to being handmade. The Aubusson may not be perfectly rectangular or evenly straight due to being handmade. 245X232cm 8'2"x7'9". An Old Hand Made French Design Wool Original Needlepoint. The Needlepoint is not perfectly rectangular or evenly straight due to being handmade. This Needlepoint is 100% handmade. 186X120cm 6'2"x4'. An Old Hand Made French Design Wool Original Aubusson. The Aubusson is not perfectly rectangular or evenly straight due to being handmade. The Aubusson may not be perfectly rectangular or evenly straight due to being handmade. 347x272cm 11'7"x9'. An Old Hand Made French Design Wool Original Aubusson. The Aubusson is not perfectly rectangular or evenly straight due to being handmade. The Aubusson may not be perfectly rectangular or evenly straight due to being handmade. The Needlepoint is not perfectly rectangular or evenly straight due to being handmade. This Needlepoint is 100% handmade. Very Nice Wool Hand Woven. The Aubusson may not be perfectly rectangular or evenly straight due to being handmade. An Old Hand Made French Design Wool Original Aubusson. The Aubusson is not perfectly rectangular or evenly straight due to being handmade. The Aubusson may not be perfectly rectangular or evenly straight due to being handmade. 305X238cm 10'2"x7'11". An Old Hand Made French Design Wool Original Aubusson. The Aubusson is not perfectly rectangular or evenly straight due to being handmade. The Aubusson may not be perfectly rectangular or evenly straight due to being handmade. 363x260cm 11'9"x8'8". An Old Hand Made French Design Wool Original Aubusson. The Aubusson is not perfectly rectangular or evenly straight due to being handmade. The Aubusson may not be perfectly rectangular or evenly straight due to being handmade. 313X240cm 10'4"x8'. An Old Hand Made French Design Wool Original Aubusson. The Aubusson is not perfectly rectangular or evenly straight due to being handmade. The Aubusson may not be perfectly rectangular or evenly straight due to being handmade. TYPE: embroidered by hand. AGE: modern. SIZE: 3.05m x 2.44m - 10ft.". 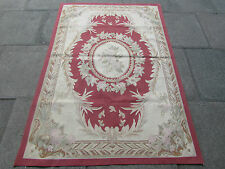 Elegant Aubusson-style Chinese needlepoint carpet with floral design. THE RUG ATTIC. MAKE THE MOST WONDERFUL. DON`T FORGET, OUR. 296X231cm 9'10"x7'8". An Old Hand Made French Design Wool Original Aubusson. The Aubusson is not perfectly rectangular or evenly straight due to being handmade. The Aubusson may not be perfectly rectangular or evenly straight due to being handmade. 144X76cm 4'10"x2'6". An Old Hand Made French Design Wool Original Aubusson. The Aubusson is not perfectly rectangular or evenly straight due to being handmade. The Aubusson may not be perfectly rectangular or evenly straight due to being handmade. 365X273cm 12'2"x9'1". An Old Hand Made French Design Wool Original Aubusson. The Aubusson is not perfectly rectangular or evenly straight due to being handmade. The Aubusson may not be perfectly rectangular or evenly straight due to being handmade. 368X268cm 12'2"x9'. An Old Hand Made French Design Wool Original Aubusson. The Aubusson is not perfectly rectangular or evenly straight due to being handmade. The Aubusson may not be perfectly rectangular or evenly straight due to being handmade. 302x240cm 10'x8'. An Old Hand Made French Design Wool Original Aubusson. The Aubusson is not perfectly rectangular or evenly straight due to being handmade. The Aubusson may not be perfectly rectangular or evenly straight due to being handmade. 280X184cm 9'4"x6'2". An Old Hand Made French Design Wool Original Aubusson. The Aubusson is not perfectly rectangular or evenly straight due to being handmade. The Aubusson may not be perfectly rectangular or evenly straight due to being handmade. 368x267cm 12'3"x8'11". An Old Hand Made French Design Wool Original Aubusson. The Aubusson is not perfectly rectangular or evenly straight due to being handmade. The Aubusson may not be perfectly rectangular or evenly straight due to being handmade. 306X239cm 10'2"x8'. An Old Hand Made French Design Wool Original Aubusson. The Aubusson is not perfectly rectangular or evenly straight due to being handmade. The Aubusson may not be perfectly rectangular or evenly straight due to being handmade. 295X260cm 9'10"x8'8". An Old Hand Made French Design Wool Original Aubusson. The weave is coarse and like 16th century Aubusson. The Aubusson is not perfectly rectangular or evenly straight due to being handmade. 359X279cm 12'x9'4". An Old Hand Made French Design Wool Original Aubusson. The Aubusson is not perfectly rectangular or evenly straight due to being handmade. The Aubusson may not be perfectly rectangular or evenly straight due to being handmade. 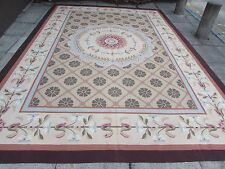 Regency Design Needlepoint Rug Carpet Aubusson Style 12x9"
267X191cm 8'10"x6'4". An Old Hand Made French Design Wool Original Aubusson. The Aubusson is not perfectly rectangular or evenly straight due to being handmade. The Aubusson may not be perfectly rectangular or evenly straight due to being handmade. 213X156cm 7'1"x5'2". 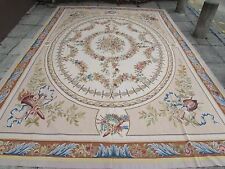 Hand Made French Design Original Aubusson Tapestry 213x156. The Tapestry is not perfectly rectangular or evenly straight due to being handmade. The Tapestry may not be perfectly rectangular or evenly straight due to being handmade. 366X272cm 12'2"x9'1". 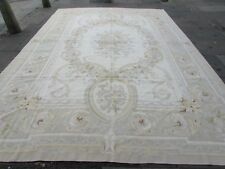 An Old Hand Made French Design Wool Original Aubusson. The Aubusson is not perfectly rectangular or evenly straight due to being handmade. The Aubusson may not be perfectly rectangular or evenly straight due to being handmade. 145X80cm 4'10"x2'8". An Old Hand Made French Design Wool Original Aubusson. The Aubusson is not perfectly rectangular or evenly straight due to being handmade. The Aubusson may not be perfectly rectangular or evenly straight due to being handmade. 300X251cm 10'x8'4". An Old Hand Made French Design Wool Original Aubusson. The Aubusson is not perfectly rectangular or evenly straight due to being handmade. The Aubusson may not be perfectly rectangular or evenly straight due to being handmade. 369X272cm 12'3"x9'. An Old Hand Made French Design Wool Original Aubusson. The Aubusson is not perfectly rectangular or evenly straight due to being handmade. The Aubusson may not be perfectly rectangular or evenly straight due to being handmade. 358X276cm 12'x9'2". An Old Hand Made French Design Wool Original Aubusson. The Aubusson is not perfectly rectangular or evenly straight due to being handmade. The Aubusson may not be perfectly rectangular or evenly straight due to being handmade. 432X300cm 14'5"x10'. An Old Hand Made French Design Wool Original Aubusson. The Aubusson is not perfectly rectangular or evenly straight due to being handmade. The Aubusson may not be perfectly rectangular or evenly straight due to being handmade. 372X275cm 12'5"x9'2". An Old Hand Made French Design Wool Original Aubusson. The Aubusson is not perfectly rectangular or evenly straight due to being handmade. The Aubusson may not be perfectly rectangular or evenly straight due to being handmade. 312X242cm 10'4"x8'1". An Old Hand Made French Design Wool Original Aubusson. The Aubusson is not perfectly rectangular or evenly straight due to being handmade. The Aubusson may not be perfectly rectangular or evenly straight due to being handmade. 430X303cm 14'4"x10'1". An Old Hand Made French Design Wool Original Aubusson. The Aubusson is not perfectly rectangular or evenly straight due to being handmade. The Aubusson may not be perfectly rectangular or evenly straight due to being handmade. 370X270cm 12'4"x9'. An Old Hand Made French Design Wool Original Aubusson. The Aubusson is not perfectly rectangular or evenly straight due to being handmade. The Aubusson may not be perfectly rectangular or evenly straight due to being handmade. 427X297cm 14'2"x9'11". An Old Hand Made French Design Wool Original Aubusson. The Aubusson is not perfectly rectangular or evenly straight due to being handmade. The Aubusson may not be perfectly rectangular or evenly straight due to being handmade. It is showing a little bit of a wear but it is normal for its age. Free across UK. Backing fabric is stained but obviously it does not show from the front of the rug. 253X152cm 8'5"x5'1". 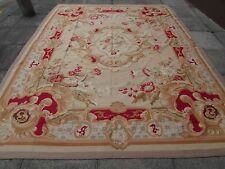 An Old Hand Made French Design Wool Original Aubusson. The Aubusson is not perfectly rectangular or evenly straight due to being handmade. The Aubusson may not be perfectly rectangular or evenly straight due to being handmade. 453X370cm 15'x12'4". An Old Hand Made French Design WoolMassive Original Aubusson. The Aubusson is not perfectly rectangular or evenly straight due to being handmade. The Aubusson may not be perfectly rectangular or evenly straight due to being handmade. 367X268cm 12'3"x9'. An Old Hand Made French Design Wool Original Aubusson. The Aubusson is not perfectly rectangular or evenly straight due to being handmade. The Aubusson may not be perfectly rectangular or evenly straight due to being handmade. 448X360cm 15'x12'. An Old Hand Made French Design Wool Original Aubusson. The Aubusson is not perfectly rectangular or evenly straight due to being handmade. The Aubusson may not be perfectly rectangular or evenly straight due to being handmade. 175X210cm 5'10"x7'. Machine Made French Design Original Aubusson Tapestry. Machine Made Tapestry. Pile or Weave Wool. Weave Machine Made. Very Nice Wool Piles. The carpet may not be perfectly rectangular or evenly straight. 429X301cm 14'4"x10'. An Old Hand Made French Design Wool Original Aubusson. The Aubusson is not perfectly rectangular or evenly straight due to being handmade. The Aubusson may not be perfectly rectangular or evenly straight due to being handmade. 265x185cm 8'10"x6'2". 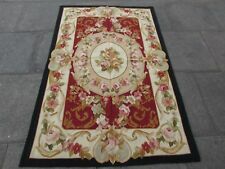 An Old Hand Made French Design Wool Original Needlepoint Rug. The Needlepoint is not perfectly rectangular or evenly straight due to being handmade. The Needlepoint may not be perfectly rectangular or evenly straight due to being handmade. 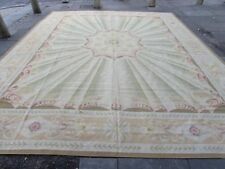 Fine Quality Traditional Sage Green Sculptured Washed Chinese Carpet. 20 mm pile. Beautiful, Vibrant and Quality! Fringe intact.